Hello loves! This week on The New Classique, I really wanted to focus on this particular outfit, not only because of how much fun it was to photograph, but also because this was a super easy outfit to put together. So let's get in to it! Starting from top to bottom we first have my favorite earrings from Midwest Handcrafted. The brand is located in Waco, Texas and is run by Kylie McKay who is probs one of the sweetest people ever. She hand makes all of her earrings (so talented) and creates them to be not only a really cute accessory, but also something unique to add to your wardrobe. Now I procured these by way of modeling for a past photoshoot for her, but you can purchase her earrings at her Etsy shop which will be linked here! Or you can DM her on insta for specifics. Her prices usually range between 20 and 40 dollars, but they are incredibly worth it. 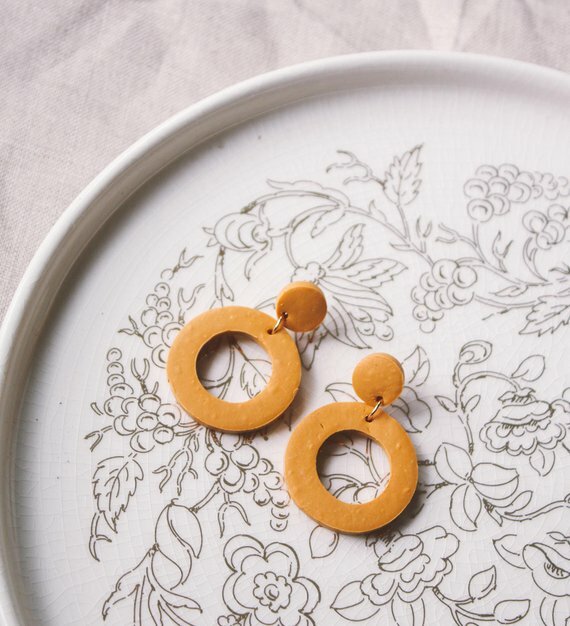 I mean it's a pretty great price for unique handmade earrings. If you want this particular pair of earrings, click here to check them out! Next up we have this really sweet romper from Zara. Now at first glance you may think it is a dress, but do not be fooled. Underneath the skirt of the dress are shorts, which is very useful considering that it's a bit on the short side. First thing that I love about this dress is the blue seersucker/pinstriped pattern of it. It's very summery and perfect for a day in the sun (or running around your backyard). I also love the ruffle detail the is above the bust and around the sleeves, giving it the youthful, baby doll vibes. Even though Zara is on the mainstream side in terms of buying clothes, I do really enjoy a lot of the looks that they have and sometimes if you play your cards right, you can find some great things on sale. Now this particular dress is no longer being sold at Zara, which is the risk you take with places like Zara, Forever21, and H&M, since they switch out their clothes frequently, but this is a similar option that you can check out here. Finally we have the shoes, which are hands down some of the best shoes I have ever gotten in terms of tennis shoes. These were a buy from Target, my favorite place in the word, and are the Interval Mesh Sneakers from Champion. The reason why I first got these is because I really like the trend of the lighter color/pastel tennis shoes that were coming into style. They seemed like something I could easily wear and transfer from outfit-to-outfit. Now I did not want to pay like 80 dollars for Nikes so I found these shoes at target for 34.99. And let me tell you, they are not only very cute, but extremely comfortable. So if you're interested, go and check them out here! All together, these pieces made a very cute and casual outfit that definitely brought out my inner kid!